Featuring durable and steady construction, our Giantex garden bed offers an ideal placefor plants healthily growth. It can be place at your garden, patio or backyard.Because of the size, plants can enjoy spacious growing and rooting space. This shape form is also convenient for you to look after them well. The entire construction is high and thick enough to protect plants' root well. With no base board, it offers opportunity for plants to directlyand deeply grow in nutritive earth and fully breath water. Not only is it a raised bed, but also can be seen as a beautiful décor and perfect complement for your home. It will be worthy of your purchasing! This beautiful item can easily be added to any yard. 〖Ample Room for Planting〗- The overall dimension is 47''x24''x9''(LXWXH). This garden bed provides sufficient space for various plants growth like flowers or vegetables. Rectangular form bed which is easy and convenient for you to look after plants well inside it. 〖Simple Assembling Work〗- Screws and assembly manual are included. Accurate and detailed assembling steps are presented in graphic form which is clear and easy to understand. 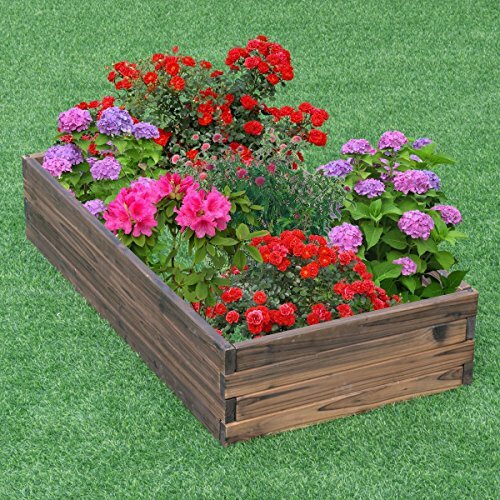 〖Stable and Long-lasting Frame〗- This garden be is constructed with environmental friendly fir wood that is durable and stable enough to make plants grow healthily. 〖Multi Use and Suitable for Many Plants〗- It perfectly fits for planting a variety of plants such as vegetables, flowers and fruits etc. Besides, this garden bed can work as a perfect ornament for your yard or garden. 〖Breathable and Protective Design〗- The garden bed frame can perfectly protect plant roots well. With no bottom base, the raised bed offers can ventilate smoothly and makes plants fully breathe water and nutrient.